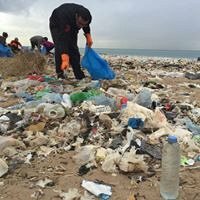 The final #RecycleLebanon beach clean up event at the Zbele bala 7oudoud Residence de la Mer is continuing and we are inviting all the environment initiatives, divers, artists, students, communities and the general public in Lebanon to take part to clean up the shorelines from Nahr el Kalb between Holiday Beach and Rimal. This is the final clean up at this beach to collect, sort and recycle the final large items on both ends of the beach. We couldn't have gotten here without everyone's stewardship at each clean up and we need all your continued help to finalise this clean up once and for all. The waste on the shoreline has come from what was thrown from the valleys into Nahr el Kalb to the sea and back onto the shorelines. All the microplastics are being blown into Zouk and onwards from the shore contaminating health and nature even more. Because people of goodwill always find a way help ! Toto - Cucina Italiana is offering the finest pizzas in town for all volunteers this weekend ! That's how we roll baby ! Totò Express. Waste including all generated trash from gathering will be picked up and recycled by Recycle Beirut, all plastic waste will be recycled by Ziad Abi Chaker of GGRIL. Green Glass Recycling Initiative - Lebanon and Cedar Environmental LLC and Arc en ciel. Tires will be recycled in the South of Lebanon and also taken to @CatalycticAction to be used to build a playground for Syrian refugee children. Women Uprising, Operation Big Blue Association-OBBA and Cedars for Care among other environmental and educational organisations will be joining for the beach clean up. Radio Beirut will be on site recording the event and sharing the sustainable community across Lebanon. For participating artists, a pop up art exhibition will be held to showcase creative awareness pieces reflecting sustainable development in Lebanon during Beirut Design Week in May 2016. More details will continue to be announced with regards to transportation services and participating initiatives and public. #RecycleLebanon is a community initiative to bring together all stakeholders in the sustainable development of Lebanon. If you are interested in contributing in anyway please reach out. Trash stick collectors, if you have. They can be found at Karout etc. - Minimise the amount of waste you bring to the gathering and practice a small and impactive step towards sustainable development by rethinking your connection to the environment, nature and what place humanity has in the world. Don't bring any single use plastic items and gift yourself a stainless or lifetime drinking bottle to hydrate daily with out further encroachment on killing nature, which includes ourselves.